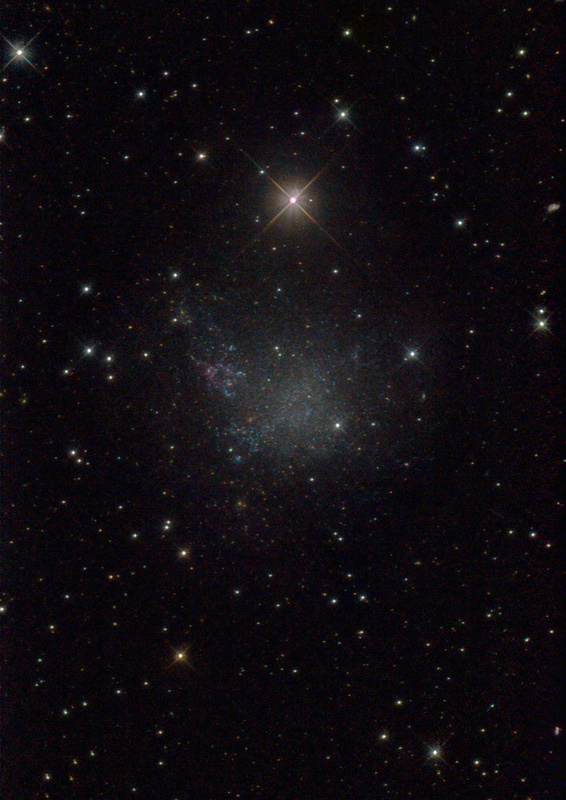 IC 1613 is an irregular dwarf galaxy in the constellation Cetus near the star 26 Ceti (the bright star immediately to the north of the galaxy). Its apparent brightness is 9,9 mag and it has a size of 16,2 x 14,5 arcseconds. The exact morphological classification of this galaxy is IB(s)m, meaning irregular, with a bar-shaped structure, indication for spiral arms, and of Magellanic type. Located at a distance of about 2,4 million light years, this galaxy is a member of our Local Group of galaxies, and can be easily resolved into individual stars. It has a prominent bar-shaped structure formed by stars crossing the galaxy in NW-SE direction. The dominant stellar population is quite old (age ~7 billion years) and is identifiable by the strong red giant branch (RGB) and red clump populations. IC 1613 was discovered by Max Wolf in 1906. Motes: Shifting of the primary mirror caused elongated star images, this could only be partially corrected for during image processing. Photo taken during my stay at the Großglockner-Hochalpenstraße in September 2007. See an Observation Report of this event (in German).